You may have heard that SANEF, the French motorway operator has now extended its Liber-t automatic toll payment service to UK motorists. I have mixed views on this and it is important that you know the pros and cons before you spend your hard-earned money on a service that you may not need. Read on. 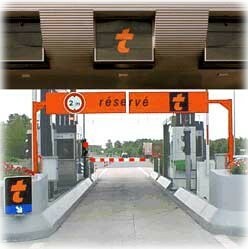 If you have travelled on the French autoroutes before, you will have seen lanes dedicated to ‘Télépéage’. Cars that pass through these lanes have a small electronic transponder that is attached to the windscreen just behind the rear view mirror. As you approach the barrier, a device near the barrier reads your transponder, extracts your unique reference and automatically opens the barrier without you having to stop and pay. The toll value is then debited to your bank account at a later date. Very convenient, wouldn’t you say? If you live in France, the cost for this service is minimal. If you only take the autoroute a few times a year, it costs you just €1,60 per month and then only for the months in which you actually use the service. However, if you are a UK resident, the costs are much more onerous. Where shall we start? First, there are the setup costs which include €10 for the application fee plus €20 for the refundable security deposit which you get back if you return the tag to SANEF. Then there is the €6 annual management fee. Thirdly, there is the monthly active service fee which is €5 per month that the tag is actually used, up to a max of €10 in a single year. Then, we mustn’t forget to add VAT onto those costs. Oh, and lastly, SANEF will add 2% to your bill when they take your payment by direct debit! That all adds up to quite a cost, I am sure you will agree. In my opinion, no. What SANEF fail to point out on their website is that you can pay the toll charges at each ‘Péage’ by using any of the major credit cards (Mastercard/Visa/Carte Bleue). If you are going to France on holiday, you will most likely not be travelling alone, so it is no bother for whoever is in the passenger seat to make the card payment. If you are travelling alone in a right hand drive car, as I frequently do, it really is no problem to hop across to the passenger seat and do the same. All that you will pay is the toll charges. Nothing more. If you are at all worried about your card maybe not working, head for the lane with the ‘assistant’ symbol and your card payment will be taken by the attendant. Lastly, here are a couple of excellent websites that you may find useful if you are driving to France for whatever reason. Pedaldancer has done an excellent post on using the French autoroutes which you would do well to digest. For detailed information about every aspect of the French autoroutes, the French autoroutes website has it all. The Bison Futé website is invaluable for real time information on the state of the French autoroutes. Lastly, if you wish to break your journey through France, do take a look at this map to see the location of some excellent B&Bs throughout the country. Drive safely.